"Keep tight inside of them - their magic must be very powerful or she wouldn't want them so badly." I was hoping to have an amazing post showing you all pictures of my daughter's Wonderful Wizard of Oz 4th birthday party today. However sadly due to some technical issues I don't have any. But don't despair my pretties I did take some shots beforehand so while we are waiting for the photos to be retrieved, I'll be sharing some of my recipes with you. 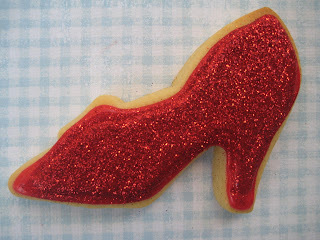 What Wizard of Oz party would be complete without Ruby Slippers, these ones were made from sugar cookie topped with a raspberry glaze, and for extra decoration I sprinkled a couple with non toxic food glitter. Then I wrapped the cookies individually in cello bags ties with some blue gingham ribbon. 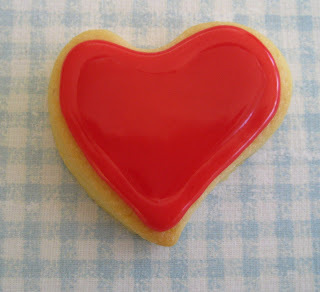 I also made some 'tin man heart' cookies with the remaining dough and glace icing, they were the perfect bite size treat to nibble on. 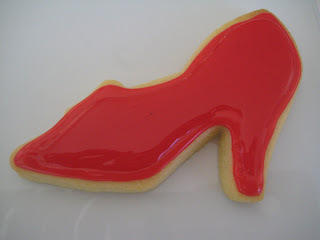 Make up a batch of sugar cookie dough (recipe below) and cut out shoe shapes. I got my slipper cutter from Little Betsy Baker it's called a high heel cookie cutter ($4.50 AUD). Pop cut cookies onto a tray and pop in fridge for 10 mins, bake cookies as per instructions and allow to cool on rack. Make up some glace icing or royal icing in deep red, you may want to leave this to rest a few hours or overnight to allow the colour to settle. You will need 2 different consistencies one for piping the outside and one for 'flooding' the inside. 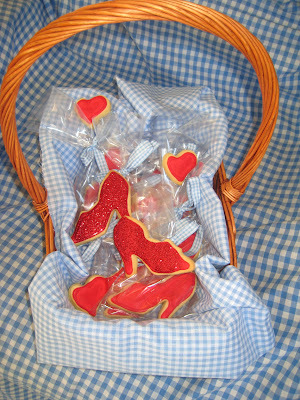 I have listed a recipe below for the glace icing I used but you could just as easily buy a premix bag of royal icing. 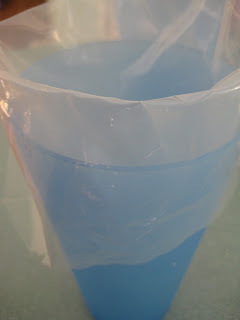 Prepare you piping bag by placing a coupler (the white thing that you can screw different tips on with) or just placing a tip directly in the bag. I fold my bags over at the top and then pop them into a big cup so I can easily pour the icing in the bag - see I've taken a really blurry photo for you to see how. 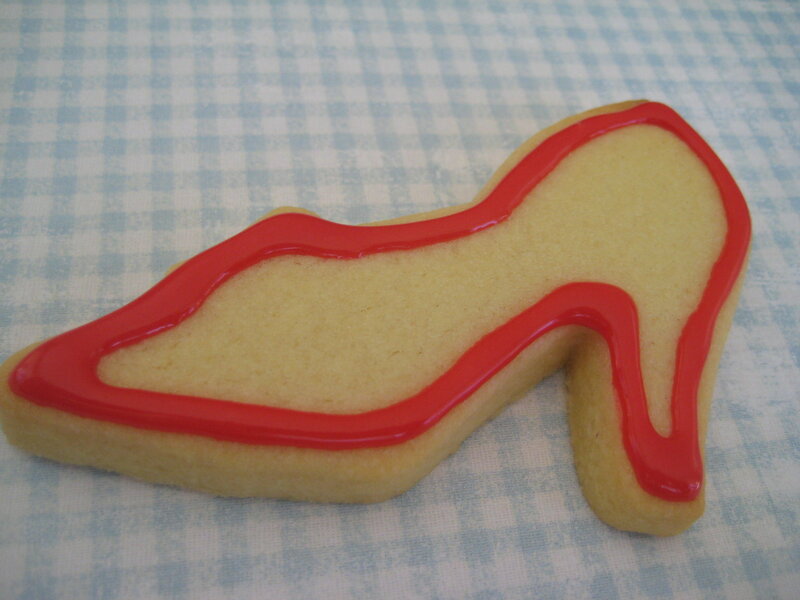 Pipe an outline round the edge of the shoe with the firmer outlining icing. Grab your bag of 'flood' icing and pipe inside the shoe, then, with a toothpick gently draw the icing out so there are no gaps showing. If your using the non toxic food glitter you can gently sprinkle it over the top at this stage, once it's dry you can sprinkle off the excess. I only decorated 2 cookies with the glitter for the top of the basket and left the remainder red. Roll out dough to approx 7mm thick, cut out cookie shapes and chill for another 30 mins on trays. Bake at oven preheated to 180 C for 10 to 15 mins depending on cookie size. 126g (4.5oz or 3/8 cup) light corn syrup - if you can't find corn syrup you can substitute liquid glucose. In a mixing bowl mix together the sugar and milk until it resembles a heavy cream like consistency, add corn syrup and mix until just combined. Add colour and flavour as required. Ensure the mixture is covered tightly with plastic to prevent drying. Icing can last up to 2 weeks in fridge and milk can be replaced with water if you are dairy sensitive. Mix until combined, the consistency should have a medium stiff consistency and hold it's shape without running when you pipe a line. Awesome. Funny, I just finished reading the book "Wicked" so the red shoes were perfect for me. Great idea. hope I am the reciever :P, look so beautiful, I love both design! Those ruby red slippers are glam! Thanks for the great tutorial. 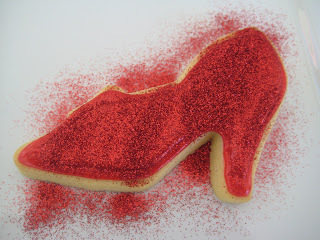 I have a friend that squeal over these cookies! they look super. Looking forward to seeing the rest of the photos. Very innovative and creative presentation. Kids will love this for sure Linda! These are too cute! What a great party idea. So cute! I love the glitter and the gingham! I love them! 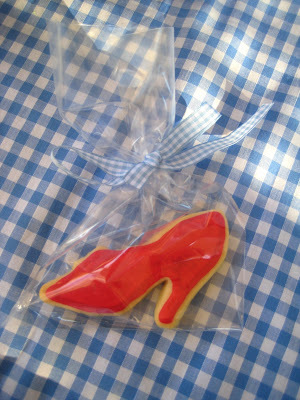 The patterned ribbon is the perfect final touch for such cute ruby slippers too!